DA Form 3986 - also known as the "Personnel Asset Inventory" - is a United States Military form issued by the Department of the Army. 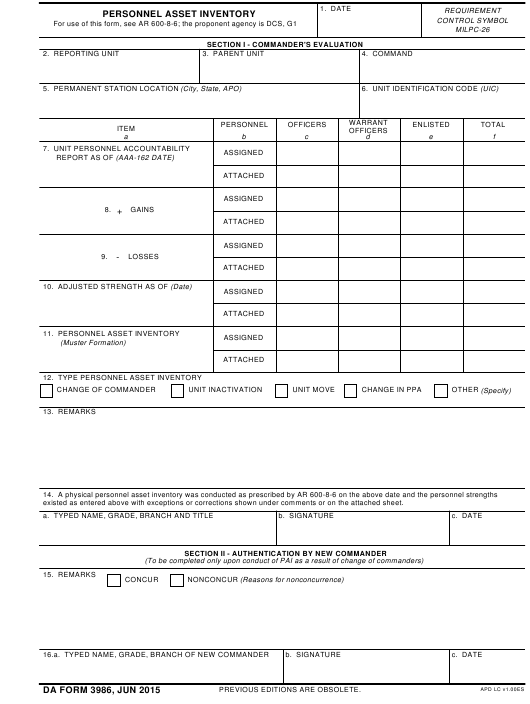 The form - often mistakenly referred to as the DD form 3986 - was last revised on June 1, 2015. Download an up-to-date fillable PDF version of the DA 3986 down below or look it up on the Army Publishing Directorate website. existed as entered above with exceptions or corrections shown under comments or on the attached sheet.